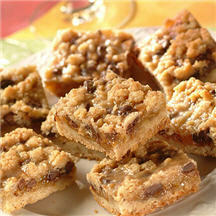 A perfect treat for friends or family, this tasty bar cookie has an orange marmalade filling and crunchy crumb topping. This recipe is from the kitchen of Joan Mastroianni of Auburn, NY. Preheat oven to 350°F (175°C). Grease 13x9x2-inch baking pan.